UPDATE 12/13/2012: Mastery Pivots, due to popular demand, now include an Overall Summary row at the top that shows the average of each column. JumpRope has always had powerful, dynamic, and flexible mastery reports that come in several formats. Our most popular (and most powerful) format is affectionately known as the "expando" report, and organizes mastery data in a meaningful hierarchy as described in this article. While the expando reports are very useful, some data analysis requires a more compact view of the data in which more information is visible at-a-glance. As you can see, the Mastery Pivot reports are available as special Grouping options within regular mastery reports. All you have to do is select a pivot-based grouping and JumpRope will take care of the settings and make sure that as much data as possible fits on your screen. One important thing to note about pivot-based reports is that there is some risk of what we call a "sparse grid" in which data doesn't exist for every relevant cell. For example, perhaps you differentiate your curriculum within your class and not all students are assessed on all standards. In this situation, JumpRope will simply display an empty (white) space for the missing scores, as is true for more of Denise's scores above. 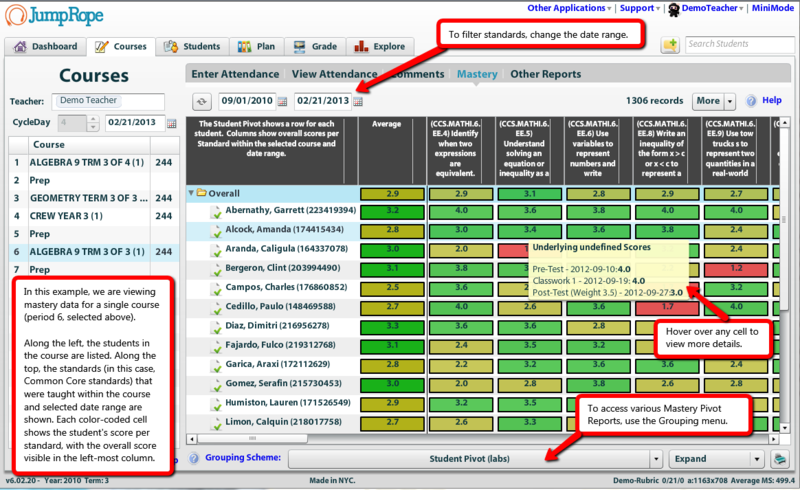 For this reason, pivot reports are not available for all contexts of JumpRope mastery reports. At the time of launch, they are available within the Courses tab, certain reports in the Explore tab, and within the school-wide Mastery reports built into the Backoffice if you have a school-wide subscription to JumpRope. Another launch-time limitation is that Mastery Pivot reports cannot currently be printed. We wanted to get them in your hands as soon as possible, and formatting these reports for printing is a challenging task. We're always excited to put new tools into the hands of educators. I hope that this new report format helps you serve your students more effectively and more efficiently. As always, let us know below if you have any comments or questions! How do I print progress reports for one of my courses?